Emirates, the largest international airline in the world announced that it will introduce a third daily flight between Dubai and Kenya’s capital Nairobi from 1st June 2017. The airline will operate the first ever scheduled commercial Airbus A380 flight to South America when it upgrades its Dubai – Sao Paulo service on March 26, 2017. From the same day Emirates will resume its flagship A380 service between Dubai and Narita. This follows the airline’s recent A380 deployment to Moscow, and will take place after the upcoming launch of A380 services to Johannesburg. It will also coincide with the launch of A380 services between Dubai and Casablanca. Flight EK717 will become the first of the three daily departures from Dubai and leave at 0140hrs and arrive in Nairobi at 0540hrs, enabling customers arriving on Emirates’ flights from India, the UK and many European countries such as France, the Czech Republic, Ireland, Netherlands and Italy to connect to the Nairobi flight within three hours. The return flight EK718 is also conveniently timed and will depart Nairobi at 0710hrs and land in Dubai at 1315hrs, ahead of Emirates’ afternoon European flights and its fourth daily flight to New York, a popular destination for Kenyan travellers. The flight will also provide 16 tons of additional cargo capacity on the route for Kenya’s main export products such as flowers, fresh fruit and vegetables, as well as key imports such as mobile phones, pharmaceuticals and readymade garments, amongst others. 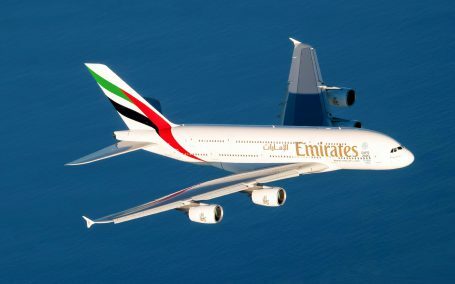 Emirates has a strong presence in East Africa and in addition to Nairobi, also flies once daily to Entebbe in Uganda, Dar es Salaam in Tanzania and Addis Ababa in Ethiopia. Emirates is the world’s largest operator of A380s, with 92 currently in its fleet and a further 50 on order. Since 2008, the airline has carried over 65 million passengers on its flagship aircraft. The airline will operate the first ever scheduled commercial Airbus A380 flight to South America when it upgrades its Dubai – Sao Paulo service on March 26, 2017. Emirates currently operates a three-class Boeing 777-300ER aircraft on its daily flights between Narita and Dubai. The resumption of Emirates’ A380 service to Narita makes it possible for Japanese travellers to fly only on A380s to their final destinations, particularly when travelling to European cities, via Dubai.